PLEASE READ!! NOTE: Please keep in mind that the USPS has box size restrictions that will prohibit these mufflers from being shipped to some countries. These are some of the countries that have restrictions: Belarus, Brazil, Brunei, Chile, China, Egypt, Hungary, Iceland, India, Indonesia, Israel, Kuwait, Mexico, Russia, Saudi Arabia, Singapore, South Africa, South Korea, Taiwan, Turkey, Ukraine, United Arab Emirates and Venezuela. We can make arrangements to ship them via FedEx but, the costs will be much higher than the shipping costs listed. This is a pair of chrome GL1800 Cobra Six-2-Six Mufflers. These slip on mufflers were specifically designed for the Goldwing 1800 and F6B's. Installation couldn't be easier, and the sweet sound gives these bikes a deeper tone without a whole lot more volume. Passengers especially will appreciate the improved exhaust note that retains the GL1800's remarkably civilized voice. These have a lifetime warranty and will fit all GL1800's and F6B's from 2012-2017. These will not fit the 2001-2010 Goldwings. These are available in either chrome or black. Please make your selection when ordering. 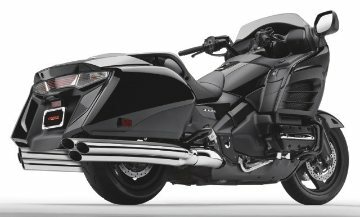 Emphasizing the six cylinders that power the classic Gold Wing engine, our six-into-two-into-six slip-on mufflers for the F6B and Gold Wing, each have three separate bodies on each side giving the bike six pipes total. Each of the three pipes on each muffler ties into a three-into-one collector that in itself is a marvel of engineering and production. That gigantic, clover-leaf shaped collector locks each tube into the perfect position, and a system of unseen brackets ties the pipes together at the rear. Cobra designed this system so that each pipe's arced bend matches that of the bike's bags, creating perfect visual symmetry. The ends also feature a radical slash cut giving them an even sportier look.